More than 77 percent of Pensacola State College Veterinary Technology students who graduated during the period from July 1, 2015, through June 30, 2018, earned a passing score on the Veterinary Technical National Exam (VTNE). The VTNE evaluates the competency of entry-level veterinary technicians and requires a passing score for a veterinary technician to be credentialed. The mean three-year national pass rate as of April 2018 for the VTNE has been 70.31 percent for first-time takers, according to the American Association of Veterinary State Boards, which proctors the examination. 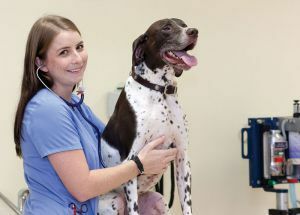 The Veterinary Technology program at Pensacola State is accredited by the American Veterinary Medical Association’s (AVMA) Committee on Veterinary Technical Education and Activities. Meyer-Paterson said that Pensacola State’s Veterinary Technology program draws students not only locally, but from around the region. It is the only program of its kind in Northwest Florida, but she said there are also students who chose Pensacola State despite having programs closer to them. Meyer-Patterson said that she utilizes feedback from students, faculty and her students’ employers to gauge the program’s success and to continually look for ways to improve. Keeping up with her students after they graduate is also very important to Meyer-Paterson. “Our graduates have above-average wages – they are very excited to tell me what they make,” she said. According to the Bureau of Labor Statistics, the median annual wage for veterinary technologists and technicians was $33,400 in May 2017. Employment of veterinary technologists and technicians is projected to grow 20 percent from 2016 to 2026, much faster than the average for all occupations. “The advising doesn’t end with graduation,” added Meyer-Paterson. She pointed out that out of a total of 64 total Pensacola State Veterinary Technology program graduates since 2013, there are only four who are not employed in the career field. Katherine Gaskill, a 2018 Pensacola State Veterinary Technology graduate, passed the VTNE in July and is now employed as an intensive care unit nurse at Oklahoma State University’s Boren Veterinary Medical Hospital. She credits her Pensacola State instructors with challenging her to be her best. For more information on Pensacola State’s Veterinary Technology program, contact Meyer-Paterson at smeyer-paterson@pensacolastate.edu or (850) 471-4673.